At Northumbria, the University Library has been proactively promoting and supporting ORCID, both as an identifier in the institutional repository Northumbria Research Link (NRL) and as part of a well-established research skills programme. 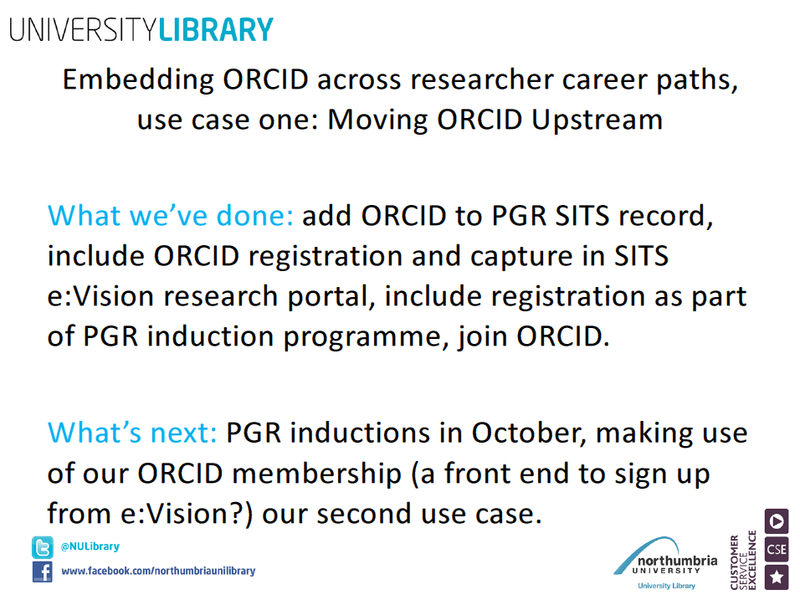 Our approach to the pilot project was to establish a partnership with stakeholders from around the University to explore the broader implementation of ORCID at different stages of the research lifecycle and researchers’ career paths. Our project involved two use cases, exploring practical workflows that would maximise the benefits of ORCID registration both for the institution and the individual. An issue we identified with our existing approach to ORCID was that our systems tend to sit at the end of the research process, for example, authors submit to NRL once their research has been published. This meant that, though we could store ORCID numbers, they were not then shared with other systems in the University. Our first use case aimed to test the idea that moving ORCID input to closer to the source of data flow through the enterprise architecture, to enable multiple reapplication in different systems. Moving ORCID Upstream added the identifier as an additional field in the postgraduate research student record. Moving ORCID Upstream has been successfully achieved through collaboration between the University Library and Graduate School, as part of the latter’s project to develop additional functionality in e:Vision, the web based student portal of SITS. An additional tab was added in MYPGR (our installation of e:Vision) for students to manage their project approval, annual progression and research skills development activity. This tab now also includes a field for the student to add their ORCID, with a link enabling them to go to the ORCID site to sign up. First year postgraduates in 2014/15 must include an ORCID in order to receive project approval for their PhD and continuing students will be required to do so at their next annual progression point. This approach ensures that our postgraduate researchers have ORCID from an early stage in their research career, and places their identifier in SITS, enabling the University to include it in the 2015 HESA return. The University Library’s Learning Support team has produced extensive guidance in multiple formats for students using MYPGR, including how to sign up for ORCID. Support is provided by the Library’s Scholarly Publications team. Further discussion of this use case is available on the project blog, and was shared in a webinar. The second use case, Enhancing registration in campus based publishing partnerships, aimed to incorporate ORCID in an Open Access journal publication service managed in our School of Law and administered by the Scholarly Publications team in the University Library. Three Open Access law journals have been published with Northumbria Journals, which operates on the Open Journal Systems software. Though it is possible for researchers to add their ORCID when they register to write, edit or review for a journal, we have experienced technical issues with our installation that have prevented us from opening our journals for submission through the OJS workflow. We have not progressed with further integration of ORCID until we have done further work with the editors-in-chief of the journals, to ensure a streamlined user experience for authors submitting to their journals. Moving ORCID Upstream has acted as a pilot for further ORCID implementation at Northumbria, providing a model for self-service registration and entry into a central part of the institution’s information architecture, supported by the University Library. This could be extended to include other staff or student groups, as relevant to the research life cycle or the requirements of external bodies such as HESA or research funders. We’ve established an approach to ORCID that is applicable to other use cases, by forging partnerships with stakeholders elsewhere in the University who could make use of ORCID and offering our skills and experience in supporting researchers through training in a range of formats and providing an expert enquiry service through the Scholarly Publications team. This applies to a number of other services who would be well placed to include ORCID at key stages of the research data lifecycle, but may not be able to provide one-to-one support for users. Academics feel overwhelmed with the range of identifiers available to them and often feel that there are few benefits to having these identifiers. They’re wary of signing up for another, but are usually interested in the idea that ORCID can be used to link existing identifiers and reduce the need for retyping information into different systems. Some of the reticence among academic colleagues is that ORCID is both an identifier and a profiling service. A member of our project team, David Young, wrote a blog post addressing this. Researchers feel that commercial profiling services such as ResearchGate or Academia.edu are providing them with an adequate presence online and do not wish to set up another profile. We try to explain to these colleagues that ORCID’s primary use is as an identifier, and they can engage as much or as little as they like with their record once they have it. We’ve also learnt a lot through the technical and legal aspects of our ORCID membership. We had amendments made to our membership agreement following advice from Legal Services, primarily relating to the ‘hold-harmless’ clause (which involves agreeing not to hold each other responsible for any damages or legal liability as a result of the agreement) and the US jurisdiction clause. Both were removed from our agreement without any further negotiation. In order to proceed with further implementation, we will need to engage more with our IT Services or develop technical capacity in-house to work with the API. Though our approach to ORCID will continue to be self-service registration rather than bulk creation of IDs, we would like to make the process of registration more streamlined for users, taking place within our web environment, with an element of authentication of IDs in our local systems. Membership of ORCID gives access to the API and introductory support from the outreach team, but without technical support in-house we have not been able to make use of the API as part of our project. This is something for us to explore as part of our continued work with ORCID and a recommendation for Jisc to investigate the levels of support institutions will need to implement ORCID. A priority for us it to continue with our work on the Enhancing registration in campus based publishing partnerships use case, working with our editors-in-chief to create workflows for submission to their journals that are intuitive for the user, including ORCID registration and entry. This will involve further development work both for OJS and making use of the ORCID API, in partnership with IT Services. We can see, as discussed as a lesson learnt from the project, the potential to roll out our current model of registration to other groups of staff and students. Again, we aim for further technical development to find ways to make this process more efficient for the user. We can also see the potential for other uses of ORCID, including enhancing data held for our institution in the Scopus database. This could increase the accuracy of our reporting on research performance in Scival, as part of a new bibliometrics service offered by the Scholarly Publications and Research Skills teams in the University Library. There are many opportunities for using ORCID at our institution and learning from other implementations. At Northumbria we are interested in the idea of a national membership to ORCID and in scoping support for this membership through Jisc. To hear a bit more about what we’ve done with ORCID at Northumbria University, as well as activity at Texas A&M and University of Michigan, you can join a free webinar tomorrow, 30th October 2014. The webinar will be held o at 0800 (New York), 1300 (London, Lisbon), 1400 (Paris, Warsaw), 1900 (Beijing), 2000 (Tokyo). Our project has two use cases, and most of our work so far has focused on the first. Many of the processes we put in place for Moving ORCID Upstream will apply to use case two. Our first use case is about where ORCID sits in our information architecture. At Northumbria we don’t have a CRIS, we have a whole range of different systems that we try to make interoperable. However, the University Library tends to sit at the end of processes of research administration, so when we’ve registered users to ORCID in the past we’ve stored the number in the repository and there hasn’t been much opportunity to share it with other systems. This use case aims to add ORCID at an earlier stage in our systems for recording information about our researchers and also at an earlier stage in the researcher’s career. The Graduate School have been redeveloping the SITS e:Vision portal so it enables postgraduates to manage their progression and project approvals in a single, streamlined process. As an extension to this, ORCID has been added to the SITS record and registration is a required training activity for all new postgraduate research students. They’re able to do this as a self-directed activity, or they can attend a registration session organised by the library. A major ‘next step’ in our project is carrying this work out during postgraduate inductions in October. Another big development in our project is our membership of ORCID. Our plan is to continue to encourage researchers to sign up to ORCID themselves, rather than to pursue bulk upload, and to instead look at how we can create a front-end for ORCID registration within our systems, instead of sending the user to another site. As we have now launched our journal publication platform at http://journals.northumbria.ac.uk/, we’re now in a position to start implementing our second use case, enhancing registration in campus based publishing partnerships. This will involve integrating ORCID registration into submission of articles to our Open Journal Systems platform. Northumbria’s ORCID pilot project has, so far, focused on use case one, Moving ORCID Upstream. To quickly sum up this use case (there’s more information about this in our project plan), we’re aiming to introduce ORCID registration at an early stage of our postgraduate research students’ time at Northumbria and create fields to store the identifier in the SITS e:Vision portal. As SITS is the central record of student registration at the University, this will enable us to explore options for interoperability with other systems at Northumbria and include ORCID identifiers in the 2014/15 HESA return. Proof of concept that could be extended to academic staff via different business systems, including the HR database. This use case is relevant to all UK HEIs, particularly those sharing similar or identical enterprise systems. It is linked to existing activities at Northumbria, including the programme of postgraduate research and professional development training coordinated by the Graduate School and delivered with involvement from Research and Business Services and the University Library, and some developments to e:Vision by the Graduate School. This work has primarily focused on creating a single, online process for project approval and progression in the 2014/15 academic year. The progression process will be included in a designated research tab in e:Vision, where the student will be able to seek project approval, complete forms for the annual progression and see details of their planned and completed professional and research training. It is in this tab that a new task will be added, requiring the student to register for ORCID and to input their ID. This will be complemented by including sign-up sessions and guidance as part of the postgraduate research student induction. Online training will be provided for distance learning and part time students and provision will be made for continuing students to register at their annual progression point. We are keen to encourage students to sign up for themselves and take ownership of their identifier. Though the purpose of including ORCID in e:Vision is to capture the identifier so it can be transferred to the student record in SITS for institutional purposes, we want the student to be aware of the benefits of ORCID and make use of their identifier. The ID will be prominently displayed to the student in e:Vision and ORCID will continue to be included in the programme of researcher development provided by the University Library’s Research Support team, with assistance available to users from the Scholarly Publications sub-team whenever necessary. The project team are currently working together to ensure all of the strands of activity (tasks in e:Vision, room bookings for sign-up sessions, online support) are in place for the 2014/15 academic year. Then attention will move to use case two, supporting ORCID registration for authors submitting articles to journals published on an Open Journal Systems platform managed by the University Library. The first journal on this platform, the International Journal of Clinical Legal Education, has recently been relaunched as an Open Access title and will begin accepting submissions in late 2014. Unique Author Identifiers: ORCID, Scopus ID and Researcher ID – what’s the difference? As we’ve mentioned previously on this blog, there is a problem in overcoming “standards proliferation” fatigue when promoting any new research tool or ID standard. The web has enabled an unprecedented level of sharing and connectivity, especially with regards to research, but the downside of opening up the floodgates means you need better ways of filtering information and finding what’s relevant. In the context of research, unique author identifiers are one way to solve the problem of author ambiguity. Being able to consistently and accurately identify the author of a piece of research is valuable for researchers (because it means you can quickly find other work by the same author and ensure your own work is linked to you) and for administrators and librarians (because it’s vital to be able to manage and report on the research your institution has produced). Several unique author identifiers have been developed to address this issue in recent years, but the three main ones are: ResearcherID (developed by Thomson Reuters and used in Web of Science and related products); Scopus Author ID (developed by Elsevier and used in Scopus and related products); and ORCID (developed by ORCID Inc., which is a non-profit, community-driven organisation, based in the USA but with international membership). At a basic level, all three tools do more or less the same thing; that is, uniquely identify an author and link this unique ID with his/her publications/outputs. However, there are important differences between them and reasons why you may need more than one. The ownership of these IDs is an important signal of their use. ResearcherID is used to identify authors and enables users to build a publication profile and generate citation metrics from Web of Science (assuming you have access to this product, usually provided through your institution). Scopus Author ID is automatically assigned to all authors and also ensures this information is accurately reflected in the various Scopus tools such as search and analytics (e.g. citation tracking, h-index etc.). * Researchers benefit from this by clearly identifying their work, but so do the publishers: ensuring their information is up-to-date and accurate means that they raise the quality of their associated search, discovery and analysis products, which potentially leads to increased traffic to these services and, ultimately, sales. If you are a researcher, then, depending on your discipline, you may need to sign up for all three. But this is not as difficult as it sounds. Both ResearcherID and Scopus Author ID have relatively painless ways of linking up with your ORCID (see ResearcherID-ORCID integration and Scopus ID-ORCID integration). This will automatically link the research linked to ResearcherID/Scopus ID to your ORCID and ensure that publication lists can be imported from one ID system into another. If you are a researcher and you haven’t yet signed up for any of these author identification tools then the best way forward is to sign up for an ORCID. ORCID is rapidly becoming the standard, and is supported by many publishers, universities and funders. * 07/08/14 Following recent discussion with Scopus on Twitter, I’ve clarified the wording here. All authors are assigned Scopus IDs – not just authors in Elsevier journals. From 30th June – 4th July 2014 the University Library and Research and Business Services are holding a Researcher Development Event. It’s open to Northumbria University staff and postgraduate research students. Join us at a Research Showcase in Mea House Auditorium to sign up for ORCID at the Library’s stand, then come along to the Northumberland Building to our drop-in session, to set up your profile and find out more about what you can do with your ID. To see details of the programme and to book onto training sessions (note: there’s no need to book for the showcase or the drop-in), visit the University Library’s website. Some background to what we’ve done at Northumbria so far and the approach we’re taking for our next steps. I was very happy to see the January 2013 announcement that Jisc, RCUK, HEFCE and HESA, among others, were backing ORCID as a proposed solution for many of the author name problems I’d encountered in working with institutional repositories. ORCID seemed like a good fit, to not only resolve these author name issues but to also untangle the various proprietary identifiers authors have signed up for to publish and share their research (Scopus, ResearcherID, GoogleScholar). Each created a silo of information about the author, with public information often not well updated where it relied on manual retyping by the account owner. I looked at ways of promoting ORCID, primarily by including links to the sign-up page in my team’s email signatures and printing flyers to use at library research support events. I then arranged for EPrints Services, our repository host, to add ORCID as a secondary identifier to NRL. This allows us to store our staff (but not postgraduate research student) ORCID numbers, though it is not linked to the registry. After these initial steps, ORCID has been integrated into our research and development training activities. Wherever the Research Support team (the wider team Scholarly Publications belongs to) go, there are opportunities to talk about ORCID. This includes slides at the end of training sessions reminding researchers to sign up, ORCID “sign up booths” at events such as the Northumbria Research Conference, where we offered a £50 prize draw and successfully encouraged the Vice Chancellor to sign up. ORCID sign-up stand at the Northumbria Research Conference. We take a carrot and stick approach to combatting this sort of resistance. The carrot: ORCID can help link all those other identifiers, accounts and systems and enable interoperability between them (less of the dreaded retyping). The stick: ORCID has been so widely endorsed in the United Kingdom it may become a requirement to participate in some research activities – so sign up now and get used to using it. Moving forward with ORCID at Northumbria, the plan is to continue to encourage voluntary sign up and provide support to users, rather than pursuing batch membership via the API (though we are pursuing trusted party membership of ORCID to test some different use cases). I feel that bulk record creation is likely to result in unused records and would rather have a smaller community of frequent ORCID users. The pilot project enables us to extend our implementation of ORCID at Northumbria, giving PGRs an opportunity to sign up at an early stage of their research career and us the opportunity to include ORCID in the HESA return. We’ll also be able to integrate ORCID as a bibliographic standard in our open journal systems publishing platform. These are great opportunities for us to speak to researchers about ORCID and encourage well-used identifiers.